Beautifully engraved certificate from the JDS Uniphase Corporation issued in 2001. This historic document was printed by the Jeffries Banknote Company and has an ornate border around it with a vignette of the company logo. This item has the printed signatures of the Company’s CEO, Jozef Straus and its Secretary. JDS Uniphase is the market leader in the design, development, manufacture, and distribution of advanced fiberoptics products for the telecommunications and cable television industries. JDS Uniphase Corporation is traded on the Nasdaq National Market under the symbol JDSU and the exchangeable shares of JDS Uniphase Canada Ltd. are traded on the Toronto Stock Exchange under JDU. JDS Uniphase Corporation is led by a strong management team, with Jozef Straus and Don Scifres as Co-Chairmen. The company has dual headquarters, in San Jose, California and Ottawa, Ontario, and its stock trades on the Nasdaq Stock Market under the symbol JDSU and on the Toronto Stock Exchange as JDU. 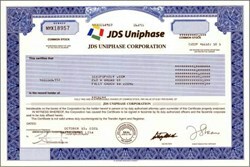 JDS Uniphase was formed as a result of the 1999 merger between JDS FITEL—a leader in the manufacturing and distribution of a wide portfolio of passive fiberoptic products, such as wavelength division multiplexers (WDMs), optical switches, and isolators—and Uniphase Corporation—a leading manufacturer of active fiberoptic components, including lasers, modulators, and transmitters. Through more than ten strategic industry acquisitions in the past two years—including the mergers with Optical Coating Laboratory, Inc. in February 2000, E-TEK Dynamics, Inc. in June 2000, and SDL, Inc. in February 2001—JDS Uniphase has emerged as a leading supplier of fiberoptic component and module technologies. JDS Uniphase offers a broad range of end-to-end technologies, and its primary focus is to be a trusted partner to its customers. These two strengths combine to produce true innovation in creating new, original products that address customers’ specific network architecture needs. Customers building optical systems look to JDS Uniphase to solve one or more of the following challenges: to extend the network with greater transmission reach, to expand network capacity with increased bandwidth, to create flexible systems, and to ensure high network reliability. To respond to these customer requirements, and also to anticipate emerging ones, JDS Uniphase has aligned its extensive product portfolios within these four key solution areas according to the particular needs of metro, long haul, and submarine systems. 2000 – JDS Uniphase acquires Optical Coating Laboratory, Inc., Cronos Integrated Microsystems, Inc., Fujian Casix Lasers Inc., and E-TEK Dynamics, Inc.
2001 – JDS Uniphase completes merger with SDL, Inc.